I've been parusing the forums here for a while now without giving anything back *evil laugh* ...but it's time I finally give back. That said, I've chosen to compete in a challenge that I won't be able to show up at ...with a plane I might not be able to build. 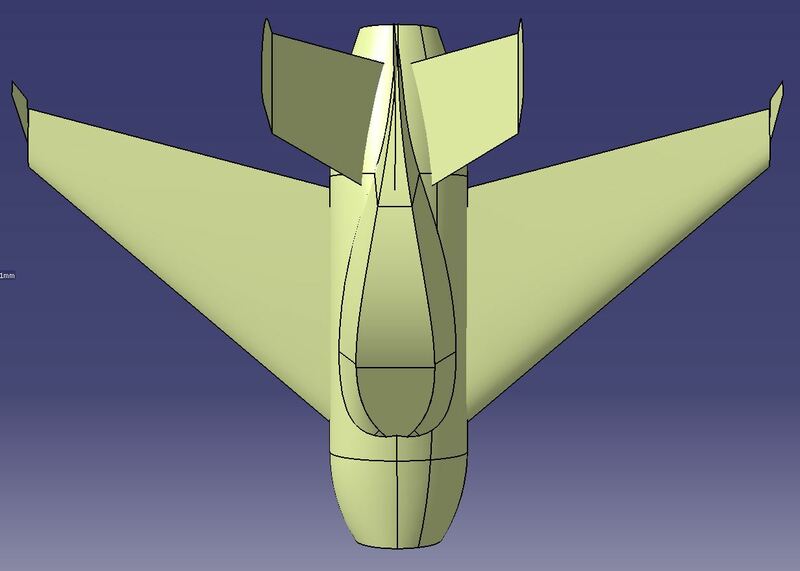 So this will be my first "real" contribution to the forums That said, I will try to document all my design thoughts, trials, failures, and successes so a new member will have a better idea how to go (or not go) about designing a scratch built plane. 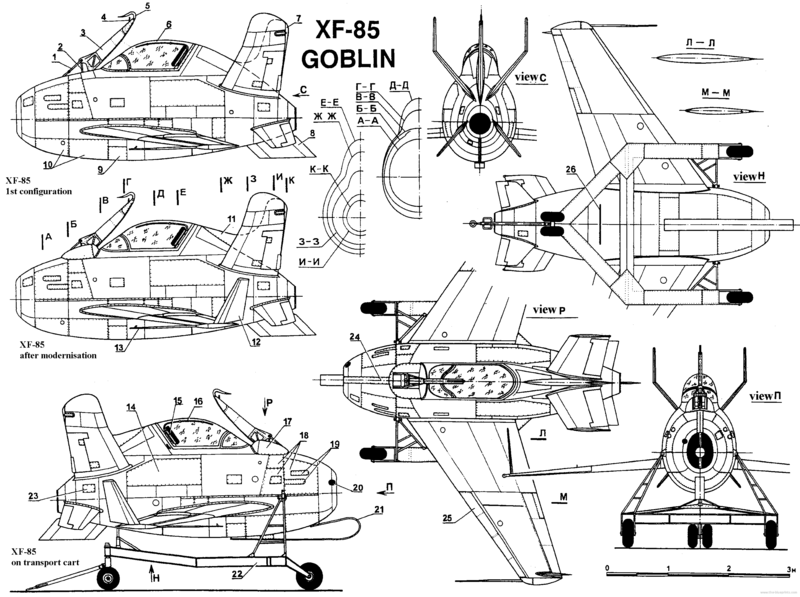 I will be designing the XF-85 Goblin manufactured by McDonnell Aircraft Corp. "The smallest jet-propelled fighter ever built"! The XF-85 was a response to a United States Army Air Forces' (USAAF) requirement for a fighter to be carried within the Northrop XB-35 and B-36, then under development. This was to address the limited range of existing interceptor aircraft compared to the greater range of new bomber designs. 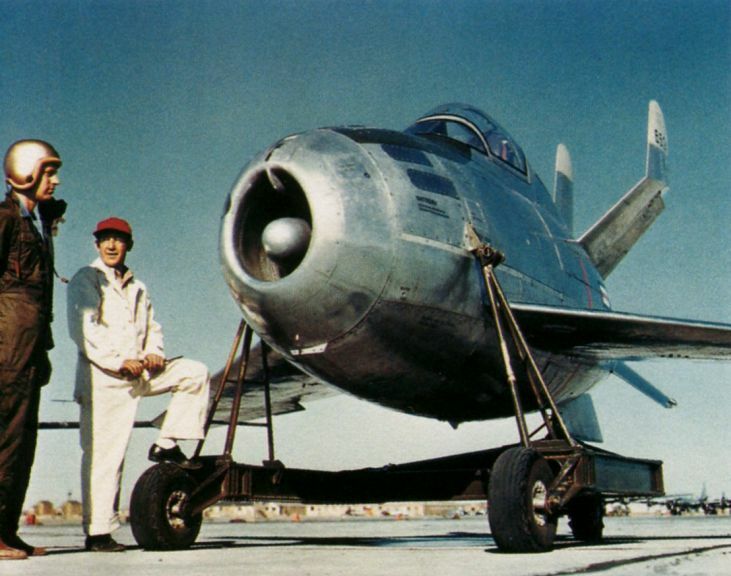 The XF-85 was a diminutive jet aircraft featuring a distinctive egg-shaped fuselage and a forked-tail stabilizer design. The prototypes were built and underwent testing and evaluation in 1948. Flight tests showed promise in the design, but the aircraft's performance was inferior to the jet fighters it would have faced in combat, and there were difficulties in docking. 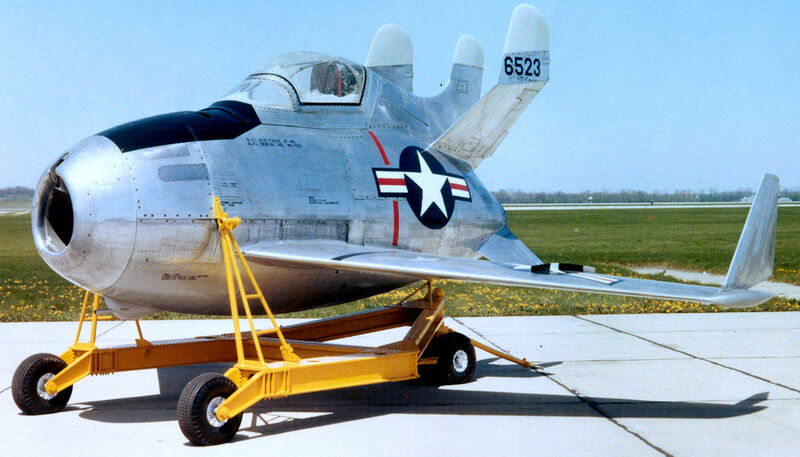 The XF-85 was swiftly canceled, and the prototypes were thereafter relegated to museum exhibits. Collect facts and gather general information about the plane you are interested in. 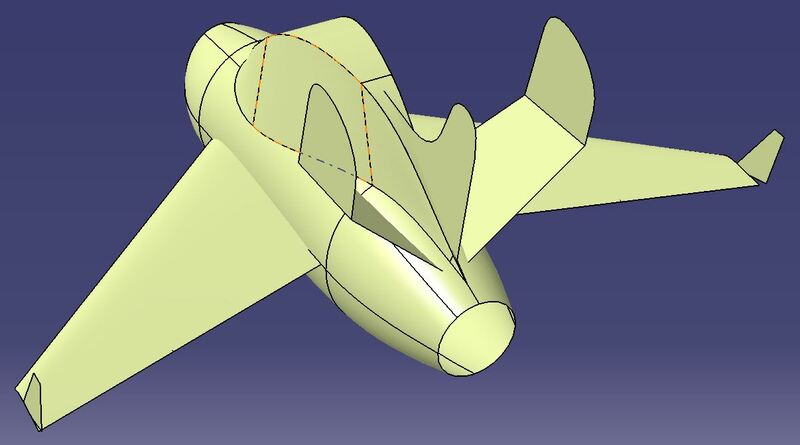 This includes stability/flight characteristics if possible (this will give you a good idea if the design is even feasible). I do you his by googling the plane and compiling a list of facts/paragraphs as seen below. Bold text is important stuff. It had an egg-shaped fuselage, three fork-shaped vertical stabilizers, horizontal stabilizers with a significant dihedral, and 37° swept-back folding wings to allow it to fit in the confines of a bomb bay. 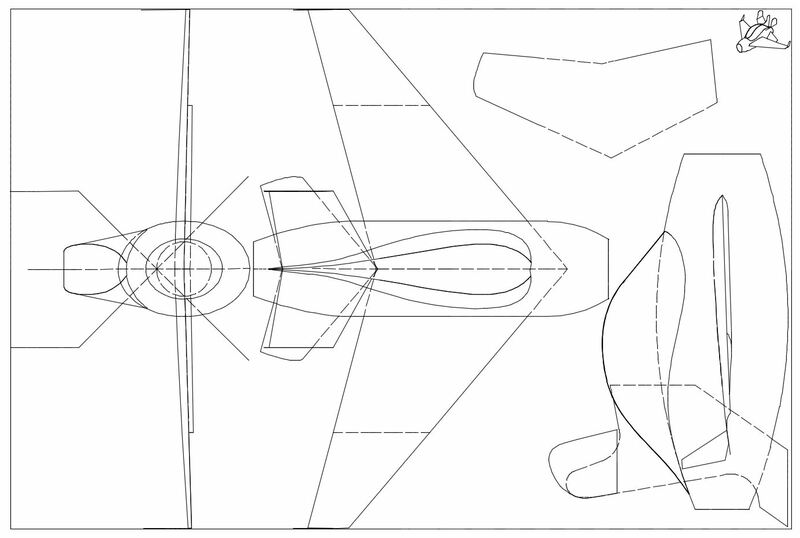 The aircraft measured 14 ft 10 in (4.52 m) long; the folding wings spanned 21 ft (6.4 m), wing area is 90 sq ft (8.3 sq m). 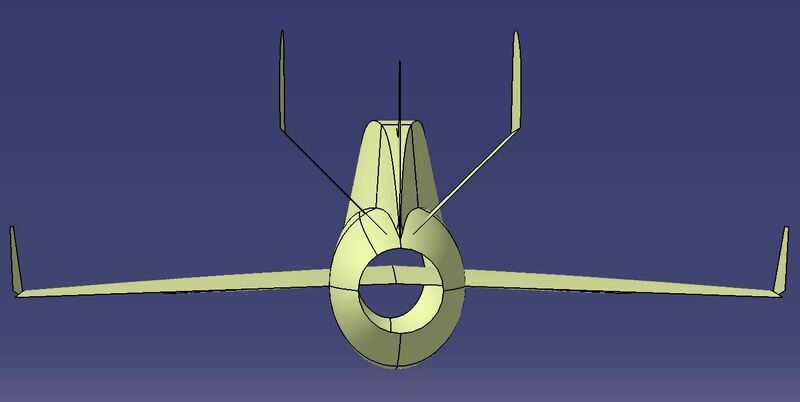 A hook was installed along the aircraft's center of gravity; in flight, it retracted to lie flat in the upper part of the nose. To save weight, the fighter had no landing gear. After the successful conclusion of two reviews of a wooden mock-up in 1946 and 1947 by USAAF engineering staff, McDonnell constructed two prototypes in late 1947. The Model 27D was re-designated XP-85, but by June 1948, it was changed to XF-85 and given the name "Goblin". The tiny fighter was stable, easy to fly and recovered well from spins. However, hooking the Goblin in flight to its bomber’s trapeze was difficult. 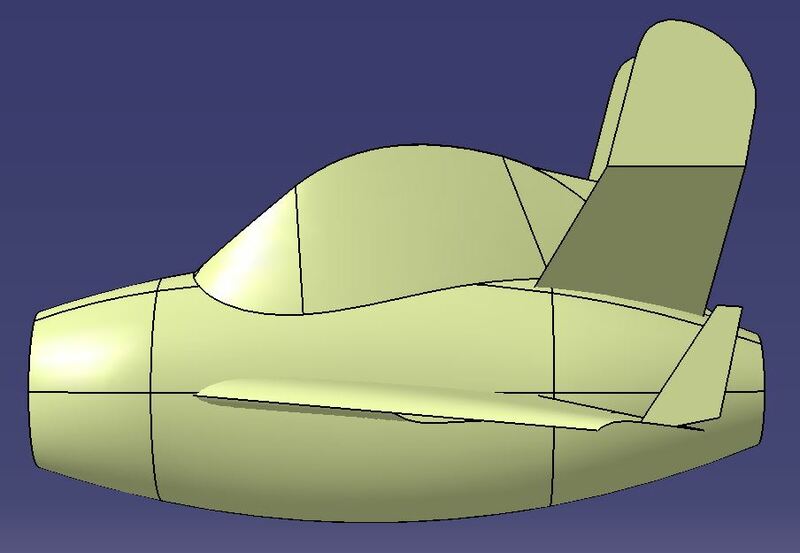 The next steps are some basic preliminary designs and to start thinking about how it will be powered (EDF, pusher prop, ducted propeller...etc). Start messing around with plans. Try to visualize how the parts will fit in 3D. Make a model in a CAD software if you can, if you can't draw some plans on napkins/notebooks/your arm...etc. JUST EXPERIMENT! This is a stage where you WILL (90% of the time ...unless you are a genius) make mistakes, you will re-do things, you will fail... JUST KEEP TRYING. This is the fun part and of course, ask for help if you need it! Started making some preliminary designs. 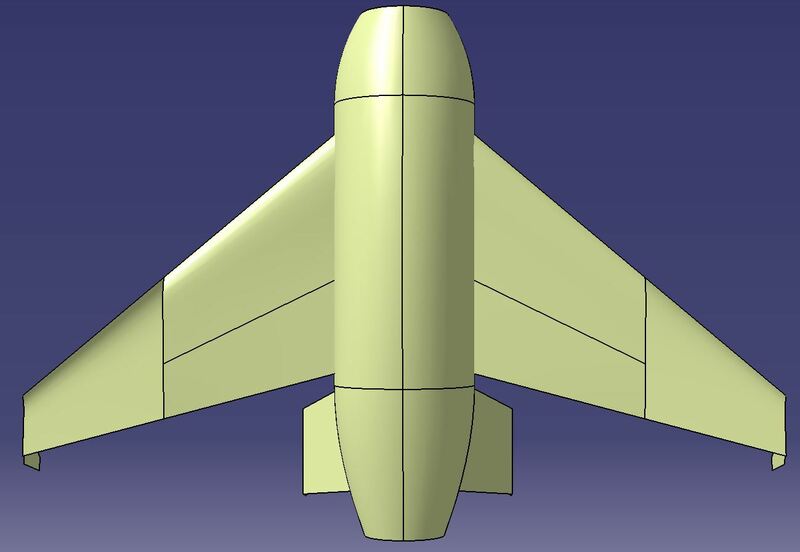 the fuselage will be a tube with two rounded ends (possibly 3D printed or complex foam cuts). I haven't added all the tail surfaces, and will probably leave them off for the preliminary designs for ease of construction. 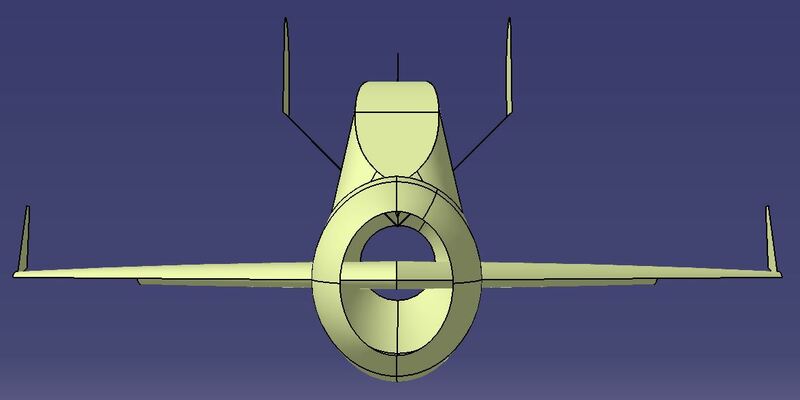 There are three more tail surfaces (two elevator, one rudder). If this needs more longitudinal/lateral stability I may add them back in. So far, the most complicated part has been the cockpit. I believe this "three piece" cockpit will be a good balance between ease of construction and scale. I have not scaled the plane yet. I plan on making a 10"-12" profile version (30mm edf), a 24"-30" version (70mm edf or prop), and possibly a 40" version (most likely prop ...I'm not that rich... come on ). 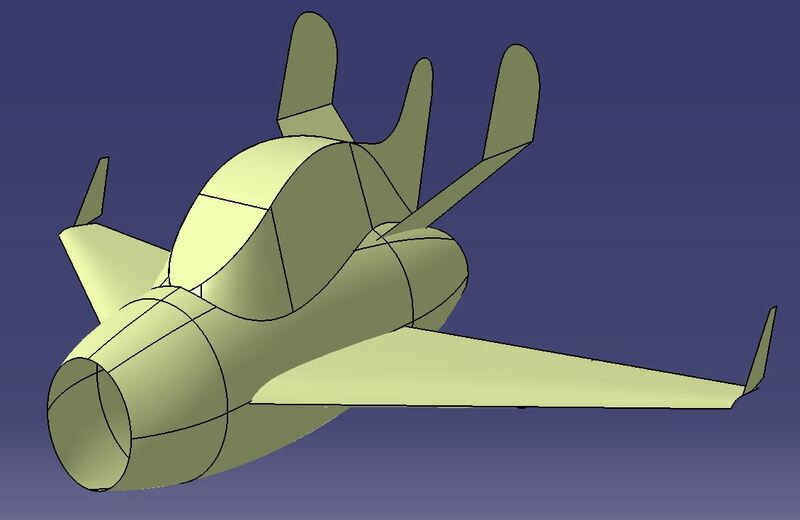 After creating the CAD model in CATIA, I created a three view drawing (with hidden lines) and transferred that to autoCAD. I prefer autoCAD for 2D line drawings because the controls are a little quicker (imo). After messing around in autoCAD for a bit re-arranging lines and mirroring bits and pieces, I have the beginnings of a plan! I haven't taken the thickness of the foam into account yet, but I believe there will be a fair bit of change before I have the shapes correct. After I get the shapes down, I'll modify the plan and include all the necessary dashed/colored lines. I don't know how to set the paper size to 20"x30" so I chose a paper size of 24"x36" ...gets the point across. I'll have to tile them and then print them at work before I can make my first prototype. Cool - This is going to be worth watching! Here is a short documentary on docking the little craft. Now someone gotta make a scale bomber for this thing, with FPV for docking! That would be cool, except if he does a 1/10 Goblin, wouldn't that need a 17 foot wingspan XB-35 (or YB-35) for scale? Man, why you gotta crush peoples dreams with logic? I can not wait to see how this turns out, good luck MrFowl! 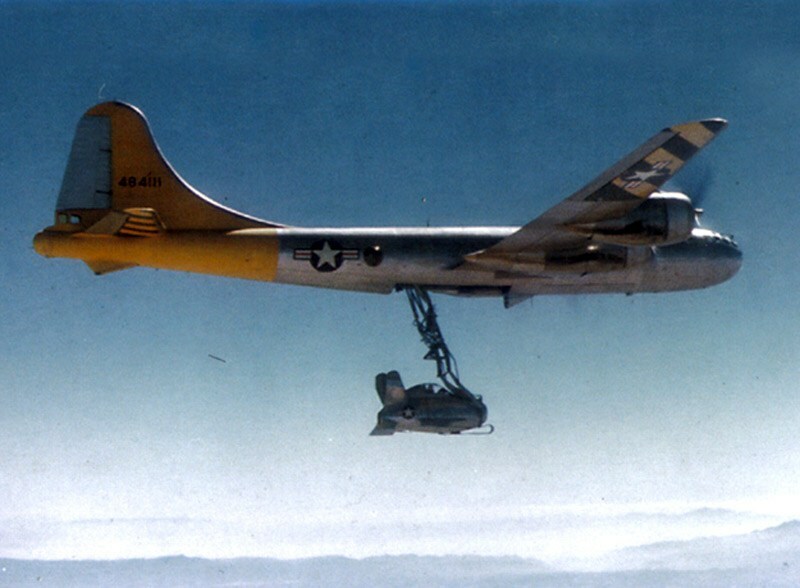 Or a 23ft B-36 Peacemaker . I'm still giving serious thought to doing a 1/18 version at a 13 ft span. That's about the largest I figure I can go on FT size motors. I just need to get a few other projects off my plate before starting something though. A 1/10th scale Goblin is only 25in wingspan ...I might do a 1/5th scale for the final version. Anything smaller and it might be too hard for a beginner to keep light. Who's gonna build me a 34ft XB-35??? I was thinking of building a micro version with depron and a 28mm edf if the larger one works out. It would have about a 10-15in wingspan (1/24th-1/17th) scale. I'm not sure I could make the wings fold at that light of weight though ...maybe spring loaded, but not servo operated. Or a 12 foot 4 motored Kracken just to get proof of concept. Well if someone had 4 sk3 500 kv motors you might be able to pull it off. I don't know the exact thrust generated by them but I know that about one of them gives about 4 times the trust of a power pack C. I have one and my friend has one as well, but I don't know if we could get another motor each so maybe a giant FFE build? Just an idea. I edited post 2 of this thread with my preliminary designs. PLEASE let me know what you think. If anyone thinks there's anything horribly wrong, please let me know before I start cutting foam. OR if you like certain parts, let me know about those too! It looks like you have the main wings on an angle. With the lightness of the foam and short body of this would that angle of incidence make it have a tendency to loop? I guess it depends on the AUW and the mass in the center of it all but I would do some glide testing with various weight amounts in the belly of that thing before powered flight to find a happy spot. I am probably wrong in my thinking as usual when it comes to fixed wing things so take that with a grain of salt. Maybe some of the more experienced fixed wingers can give us a short lesson how to find and manage that angle during the design stage. Nice progress. It is looking good. I think that incidence you're seeing an optical illusion. I didn't design any incidence into the wing. It could be because in these views I'm using "perspective view" instead of "parallel view" which would makes it look better, but is not exact (as it uses a vanishing point). I starting playing around with the wings and they look very similar to the versa wing already... I might just build it around those wings for ease of construction/time tested design. Any more progress towards turning her into foam?